Well it has been one hell of a week, hardly any time to get anything done and pretty much everything I did get or do went to hell in a matter of seconds. 1. So my order of GW books finally arrived after 2,5 weeks and in all my excitement I missed another GW screw-up. A single Horus Heresy novel was missing from the package....and guess which one. That's right the first one, Horus Rising. So much for getting stuck in on those this week. Luckily there are two Ciaphas Cain books in there as well, so I should have plenty of stuff to keep me occupied during the tedious hours spend in public transport. 3. 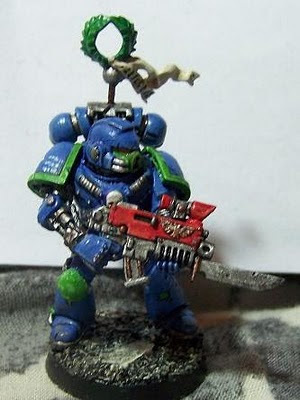 One thing that did you alright is the Ultramarine I put together for fellow-Astronomican forum member Domdan. This guy is going in the mail tuesday to, hopefully, make a fellow hobbyist happy. Well let's hope things go a bit smoother next week and I may end up showing off another mini or two by its end!